Every month Foodbuzz has a very fun 24x24 event which focus on a particular theme. 24 blogs are chosen based on the submitted proposals and these 24 blogs post on their recipes. This month sponsors,Frigidaire and Food buzz are partnering for a cause to support Save the Children's effort in making available healthy and nutritious food for children in need year round in the United States, especially during the holiday season. To recognize the charitable partnership of Frigidaire with Save the Children the 24x24 event this month focuses on"set a place for: kids meals and parties". I am so delighted to join 23 other bloggers in participating in this Food buzz event. 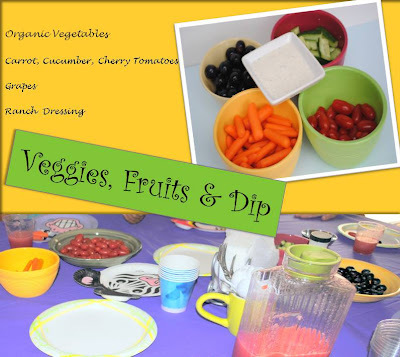 Nutritious food is very important for children to blossom into healthy adults. As a famous Indian Tamil poet Avvaiyar put it, "Poverty is (torture) hard. Poverty in childhood is harder ( more torture)." Lack of proper nutritional food hinders their social, emotional and overall development. Childhood is such an amazing phase in a humans life. It marks a time filled with fun, innocence, laughter, giggles, friends, learning, growth, explorations, pretend playing and being worry free. Childhood experiences have a great impact on an individuals outlook in life. Hence providing a balanced meal is very important. When it comes to food most kids are very picky. They do not want to eat healthy food. By involving them in cooking and making it fun for them, kids can learn about ingredients in food preparations and develop an interest for cooking. Store-bought food usually contain additives and preservatives that are not healthy. Home-cooked meals are healthier and tastier. Even the so called junk food can be made healthier at home. With the start of every new school year, kids are faced with a lot of new challenges. Socially they have a lot to adjust to. It drains them emotionally when they find themselves in a new classroom environment, teachers and friends. Not having their old friends with them when they move from grade to grade can be unsettling and it takes some kids a while to find a friend to connect with in their new class. A perfect way to help them get over this situation is to invite new friends over for a play date. 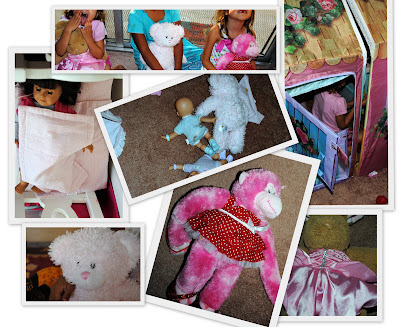 My proposal for the event was to have a play date for my daughter and engage the kids in making their own food..This weekend my daughter invited her friends over for a play date and suggested that they bring their favorite doll with them to pretend play. Hence we had a play date for the girls and dolls. Two of her friends came over to our house and they had such a fun time playing, helping me in the kitchen with food preparation and enjoying their creations. I know the play date was a big success because at the end of the day they wanted to come back again for another play date. It did not stop with that, they suggested that I make them mango slushy the next time. As for me I had such a relaxing fun day with the kids and did what I most enjoy, cook with them. 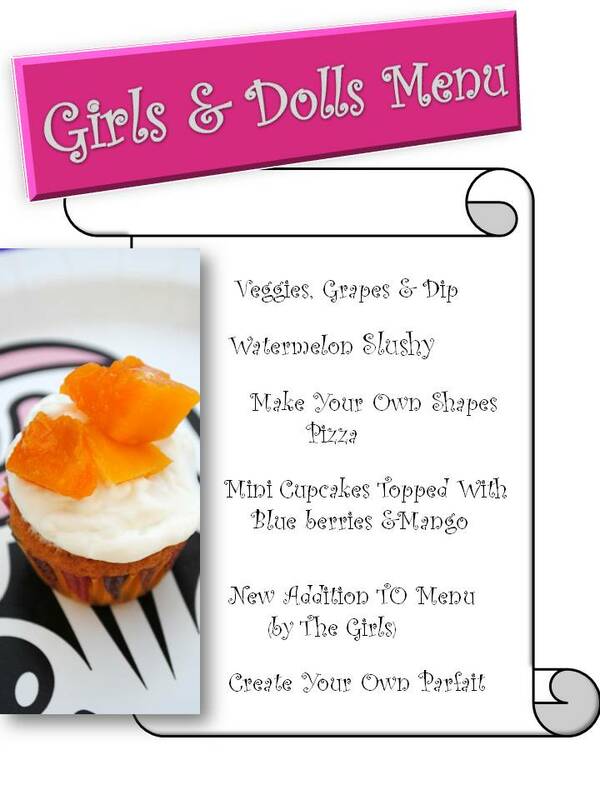 Here are the recipes for some of the items in the menu. Pizza making is always fun. They loved using a flower, star and heart cookie cutter to create their own pizza. 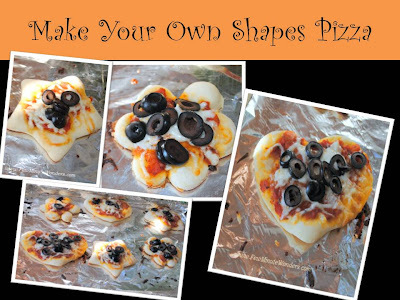 The home made pizza dough is a breeze to make with a food processor and is available here. Topped with home made organic marinara sauce and cheese it was very exciting for them to see the shapes puff up in the oven. 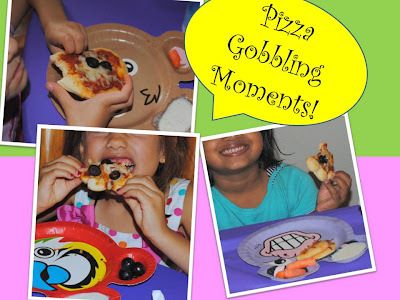 Once the pizza was out we could hear loud cheers for their own cookie cutter pizza. 1. In a food Processor add eggs, butter, oil,vanilla essence and water and give it a buzz for 30 seconds. 2. Add 1/3 of the cake mix at a time and buzz until they are mixed slightly. 3. Once all the cake mix has been added. Run the food processor for a minute. 4. 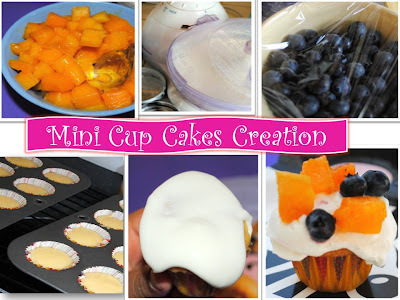 Place the paper cups in the mini cake baking tray and spoon to cover over 1/2 the mini cake paper cup. 5. Bake in a 350 degree oven for 16 to 18 minutes or until they are golden brown on the top. 6. Remove and allow it to cool before frosting. 1. In a cold bowl add the whipping cream and whisk with an electrical hand blender until it starts to thicken. 2. Add sugar and whisk to form stiff peaks. Serve it immediately with blueberry and mango toppings. Having the mini cupcake on the menu was a big hit. The girls got so excited and were full of smiles and soon all the 40 cupcakes disappeared. 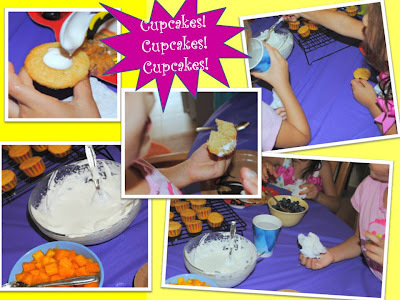 They loved the idea of having a choice of choosing something healthy, colorful and tasty to top their cupcakes with. The whipped cream started to thaw a little but that was what got them so elated. 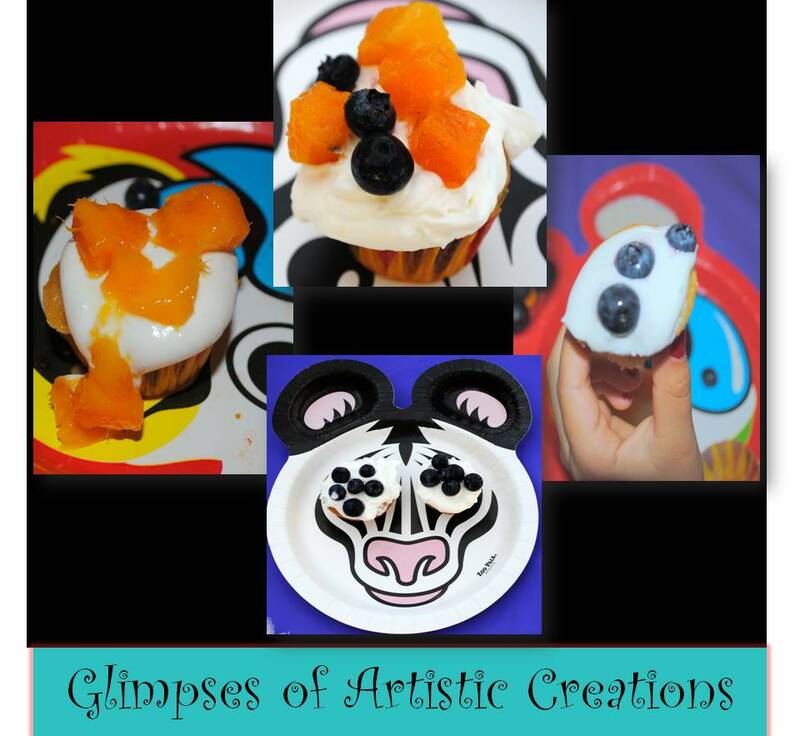 They were like an artist with a brush (spoon) and a canvas( mini cupcakes and colorful toppings). 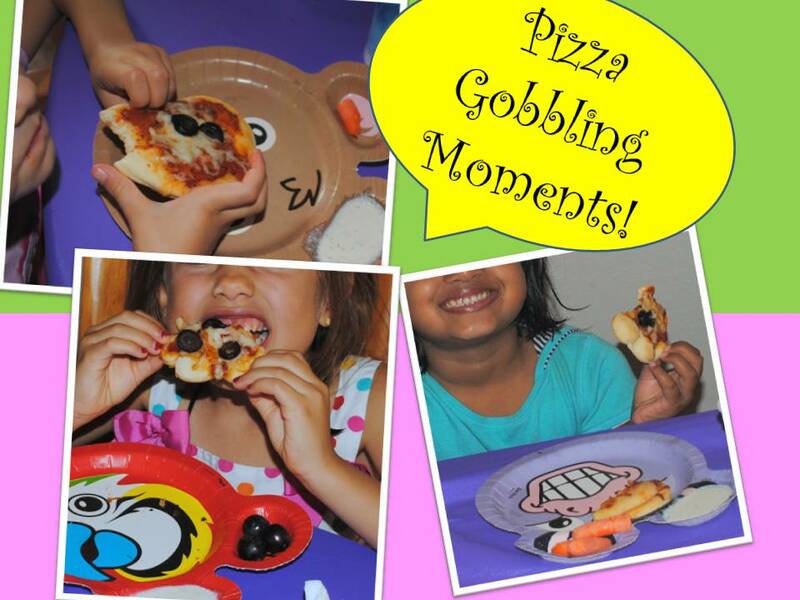 This is the most I have seen of kids enjoy their food. They were strapped to their seats for almost an hour. It did not stop with the cupcakes.When all the mini cupcakes were consumed,the girls go so creative and came up with their own version of whipped cream and fresh fruit parfait. I must say it was simply delicious. excellent idea. The food looks yummy, the gals look cute. What a fantastic way to have a playdate. OMG! absolutely gorgeous. Superb post. I love the way you have presented. Simply superb. Photos are awesome and the menu cards as well. Hats off! the watermelon slushie is my favorite. I want a sip. Awesome post...everything looks lovely...Two thumbs up!!! Great job! A lovely 24 x 24 post! what a wonderful idea. 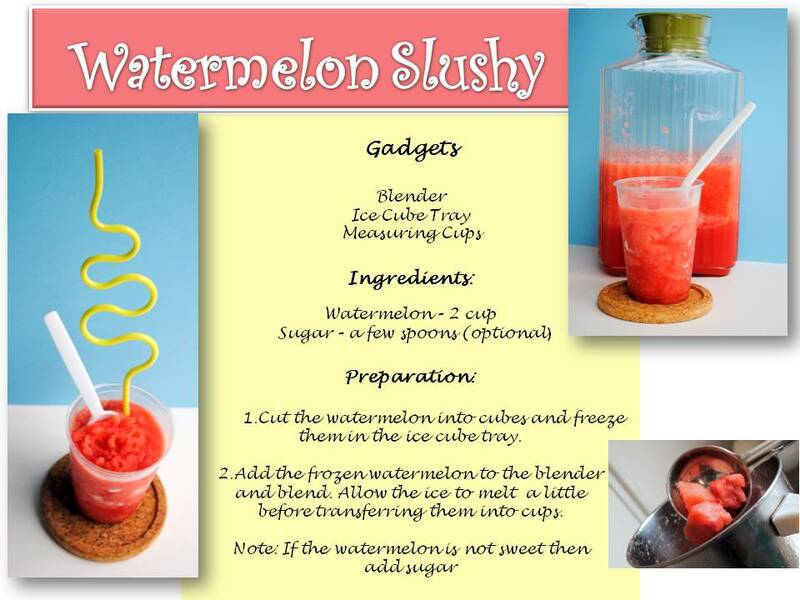 I love the watermelon slurpy. Cute post..everything look so colorful, beautiful and vibrant!! I'm worried about their dental health because my kids wouldn't be happy if they cannot eat sweets in a day.